The cover price is US$30.00. This book contains 144 pages. Reprint Information: Number of pages = 6. Download for free pp 664-669. This article provides information about a method of augmenting an aerial shell’s aesthetic performance that is simple, high profit and widely appreciated by display sponsors. This method was first discussed many years ago by the authors as part of an article on electrically fired displays. In that article, these effects were described as parasitic firework effects. They were described in that way because the “parasitic” firework effects (small shells, mine stars and other small components) derived their lift energy from other “host” aerial shells. In the present article, because it is more descriptive, these same effects will be called augmentation effects. Reprint Information: Number of pages = 4. Download for free pp 699-702. Reprint Information: Number of pages = 22. Reprint Information: Number of pages = 2. Download for free pp 732-733. Reprint Information: Number of pages = 3. Download for free pp 734-736. A series of experiments are being conducted to more definitively establish the difference between the causes of so-called flowerpots and muzzle breaks. Testing was performed to document the effect of firing small firework aerial shells after having intentionally provided fire leaks into those shells. The idea for this testing originated from a conversation that occurred during a break between paper presentations at the First International Symposium on Fireworks. At that time, the authors were engaged in research to determine the cause and mechanism of some types of aerial shell malfunctions. This work focused on the time taken for various size aerial shells to explode after the ignition of their contents and the time for those same size shells to exit a mortar after ignition of their lift charges. Based on this work, the authors had concluded that relatively minor fire leaks (through small holes and cracks) would be expected to preferentially produce muzzle breaks rather than flowerpots and that flowerpots must be the result of more substantial fire leaks into the shells. Part of the reason for the conversation was to solicit input regarding the authors’ work from two persons highly knowledgeable in the manufacture of aerial shells. Reprint Information: Number of pages = 5. Download for free pp 743-747. Reprint Information: Number of pages = 2. .
As used in this article, the definition of “manual firing delay time” is the time interval between the manual ignition of the tip of the shell leader delay element and when the aerial shell fires from its mortar. This delay time is of interest in the context of the delay time requirement in the National Fire Protection Association’s Code for Fireworks Displays (NFPA- 1123). Reprint Information: Number of pages = 10. Although widely used, the term “flash powder” is poorly defined; there is nothing even approaching universal agreement about exactly which pyrotechnic formulations are and are not fireworks flash powders. This would be of some concern under any circumstance; however, it is the use of the term—flash powder—in regulations that greatly magnifies the problem. One might expect that an agency choosing to use the term “flash powder” in their regulations would have a responsibility to provide a reasonably precise definition for it; if not providing a generally applicable definition, then at least a definition for use within the context of the regulations. Unfortunately, this is not the case. Reprint Information: Number of pages = 3. Download for free pp 771-773. It is difficult to argue that the quality of Chinese fireworks has not improved greatly over the past 25 years. However, that is not to say that on occasion, one still does not encounter quality related problems, sometimes so extreme that it is hard to believe. The photo in Figure 1 is of a 3-inch (75-mm) aerial shell and is such an example. (The authors encountered this shell several years ago, while working briefly in Australia.) Based on the location of the shell’s crossmatched time fuse and suspender ring, the lift cup has clearly been attached to the side of the aerial shell. One might suspect that this was an attempt at a cleaver new design, were it not for the fact that this shell would not fit into a 3-inch mortar, and that the other 71 shells in the case had been constructed normally. Before seeing this shell, who would have believed that such an incredibly obvious error could ever have been made by a worker attaching lift cups, and if made, how could it have escaped the notice of the worker packaging shells to make it through any quality control process! Reprint Information: Number of pages = 1. Download for free pp 774-776. Display operators need to be aware of the potential for some tiger tail comets to produce extremely dangerous fallout. The problem was discovered only recently and was then investigated by the authors on a visit to the display company’s facility. The shells in question are 4- and 5-inch (100- and 125-mm) White and Red Tiger Tail comets as shown overall in Figure 1. While all of the shells have the same basic labels, there were slight differences as noted in Table 1. However, in trying to determine whether any particular tiger tail comets have the problems found in the ones being discussed in this article, it is probably wise to consider that Chinese manufacturers frequently subcontract work and otherwise share production. Thus, it is possible that not all of the items labeled and appearing as shown in this article may have a problem, and it is also possible that items labeled and appearing differently may have the same problem described in this article. Reprint Information: Number of pages = 3. Download for free pp 777-780. Reprint Information: Number of pages = 6. Download for free pp 786-790. 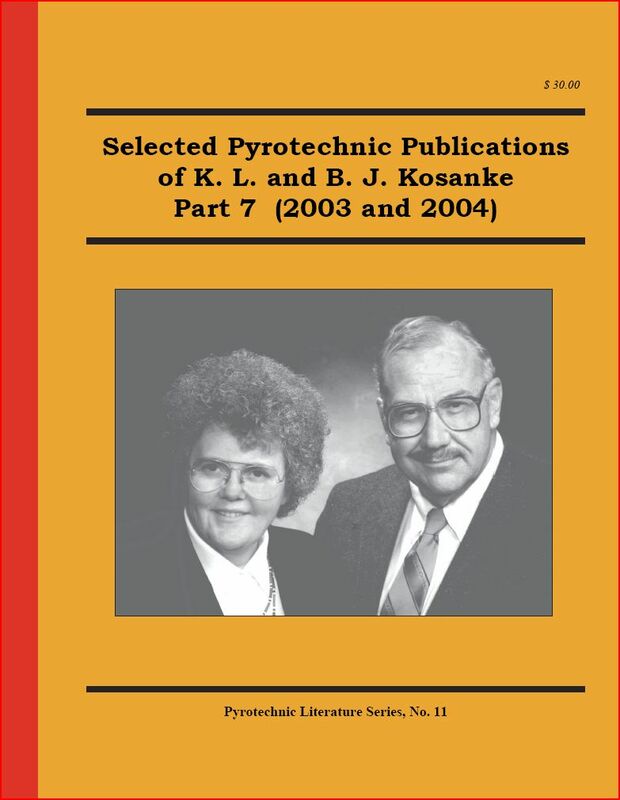 While working on the 2006 edition of NFPA-1123 Code for Fireworks Display, the Technical Committee on Pyrotechnics of the National Fire Protection Association (NFPA) received a request for a “Formal Interpretation” regarding the 2000 edition of the code. In effect, a request for a Formal Interpretation is a request for the committee to provide clarification or a ruling regarding one or more paragraphs in the code. According to NFPA practice, a request for a Formal Interpretation must always be phrased in such a way that it can be answered either “yes” or “no”. 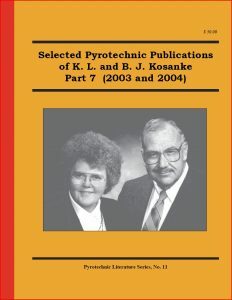 This article addresses that request for a Formal Interpretation and was written because: 1) the question being posed was reasonable and important; 2) a simple yes or no will not meet the needs of the requestor; and 3) to stimulate a discussion of the issue, such that the display fireworks industry might then provide guidance to the committee before they address the issue at their next committee meeting. Reprint Information: Number of pages = 5. Download for free p 791. The title of this very short article is, in effect, a direct quote from a label found on some display firework aerial shells. As it turns out, the label is more literally correct than might have been intended. Note that one of the instructions is to “LIGHT FUSE BEFORE PUT IN TO MORTAR…” Few if any would argue that users should not be “warned” about such “extremely dangerous directions for firing”. As regards this particular label, it would definitely seem to be a good thing that many inexperienced users of display fireworks fail to read (and in this case, rigorously follow) the use instructions accompanying them. Reprint Information: Number of pages = 1. Download for free pp 792-795. Reprint Information: Number of pages = 4. Download for free pp 796-797. At a recent meeting of the National Fire Protection Association’s Technical Committee on Pyrotechnics, there was a proposal to increase the site size requirement for public fireworks displays from the current 70 feet (21 m) to 100 feet (30.5 m) radius per the largest shell size in inches. It was the consensus of the committee that this was not needed because fireworks displays using the current distances were “safe enough”. However, no one was able to substantiate their opinion with data. As part of that discussion the authors offered their own unsubstantiated opinion that it was likely that people were at a significantly greater risk while on the round trip drive to witness a fireworks display, than from the fireworks in the display. After offering some background information, this article presents a calculation of the comparative risks of driving to and attending a fireworks display, estimating that people are at least 7 times more likely to be killed or injured as a result of driving to attend a public display than they are from the fireworks in the public display. Reprint Information: Number of pages = 2. Download for free pp 798-800.